Our weather seems to be getting stranger and stranger, part of January this year was quite mild and wet and as a result there were fungi around, not least some quite substantial fruitings of Pleurotus ostreatus, the common Oyster Mushroom. On Hampstead Heath during mid January I found two spots where Oyster Mushrooms were growing in profusion, a lovely dark grey and as fresh as daisies, without the usual grubs that are often associated with them during the summer or autumn. The Oyster Mushroom is known to fruit all year round but conditions have to be optimum (warmth and moisture) and they certainly were during January. This was not the only species around at that time, there were Mycena’s, Collybia’s and Hypholoma’s among others, of which the highlight has to be Tremella foiliacae. This is a fungus with a jelly-like consistency, with many separate red-brown lobes, that often look brain-like. 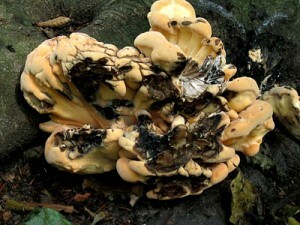 Many species of this genus are parasitic on other fungi, this particular species parasatizes members of the Stereum genus, these are smallish, flat (resupinate) or half cap, half flat, (semi resupinate) tough fleshed, fungi, that can be found on the bark of various trees, especially Oak. The Tremella I speak of was fruiting on the branch of a fallen Oak, right next to a colony of Stereum hirsutum, the hairy stereum. Alas this mild wet weather was not to last and we were hit with a prolonged cold snap that had me wondering whether spring would actually arrive. Spring did arrive but a little later than it has done in more recent years, my first record of Calocybe gambosa, the St Georges mushroom, was 18th April, some two weeks or so later than in 2005, though still before the 25th April, St Georges day. This mushroom then continued well on into late May. I had no records of Morels unfortunately, though I do know of some people this spring, that had more luck than I did on the Morel front. But I was kept busy with other finds, such as Melanoleuca grammopodia, an uncommon species that prefers rich soil, like that of compost heaps etc. Following the water board’s decision to impose water restrictions, our weather decided to show them all up, with well over a weeks worth of constant rain, and what comes with the rain? yes you guessed it, mushrooms! Agrocybe praecox fruited in abundance on the woodchip flower beds in Golders Hill Park, close to Hampstead Heath, the earliest record I have had of any Russula species (18th May) was taken by a flush of Russula grisea on a small grass verge in Golders Hill Park. These are mycorrhizal fungi, (symbiotic) with various trees and shrubs, this particular species can be found close to either Beech or Oak, there happens to be a Beech tree in one of the gardens, fenced off but backing onto the park. This find really surprised me, these are summer/late summer to autumn fungi, to find them in May is very unusual. Also in the same patch of grass was a single specimen of Inocybe asterospora, named so because of its star-shaped, microscopic spores. In 2005, during the first spring walk on May 7th, we came across the earliest fruiting I’ve seen of Laetiporus sulphureus, Chicken of the woods. My feeling for Spring 2006 was that it just hadn’t been warm enough for this species to fruit at that point, though lo and behold, during my workshop foray on May 20th, we found a much fresher, younger specimen, fruiting from a dead, fallen trunk, of Willow, you just never can tell. 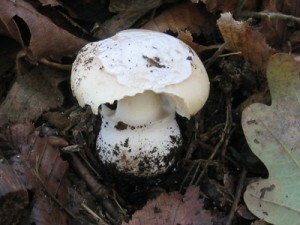 There have also been fruitings of various Agaricus species, (those that belong to the Field Mushroom family) such as A. osecanus and A. impudicus , as well as a plethora of tiny Ink caps growing on the woodchip beds strewn across Golders Hill park. Other species noted were Pluteus umbrosus, Pluteus cervinus, Pluteus chrysophaeus and the eyecatching, though small, bright orange-red fruitbodies of Mycena acicula. Now as we move into summer, will we get the rain and warmth for this fruiting to continue? we shall see. 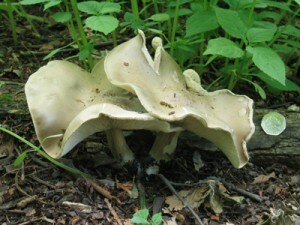 Following a very hot and dry June and July I was in serious doubt as to whether the first foray of the summer would yield much at all, apart from the usual large brackets of Ganoderma australe, in fact I was considering canceling the foray. However, during the week leading up to the foray there were signs that things were about to change. A relatively dramatic drop in temperature, by some 10 degrees or so, seemed to have triggered fruitings of Laetiporus sulphureus ‘The Chicken Of the Woods’. This fungus had already made an early appearance during May, albeit only here and there, but during the first week in August it began to fruit in numerous locations in NW London, mainly on Oak trees. Also fruiting fairly prolifically was Ganoderma resinaceum, a large and handsome bracket fungus that forms a resin that creates a red-brown crust on its upper surface, when young it can look quite stunning, as if like freshly cooked bread emerging from the tree, with a Tequila Sunrise crust. This fungus prefers Oaks, though can sometimes be seen on Beech, on Hampstead Heath it fruits mainly on Turkey Oak, Quercus cirrus, a non-native Oak. With a small group I went ahead with the foray and it went very well considering how dry it had been. Rain had been forecast on the approach to the weekend but I didn’t really want it to be raining during the foray, still you can’t have the best of both worlds and at least we got the rain, which bodes well for next weekends workshop on H.H. and foray at Epping Forest. It was only a matter of half an hour or so before the group came across, fresh and slightly older fruitings of ‘Chicken of The Woods’ which was fruiting on what is left of a big old Willow tree on which it fruits practically every year. More and younger fruit bodies of the fungus were found during the foray, mainly on English Oak, Quercus robur. Also beginning to fruit on the Oaks was ‘The Beefsteak Fungus’, Fistulina hepatica, probably a few weeks ahead of when it generally begins to fruit. A few young florets of the ‘Giant Polypore’ Meripilus giganteus were also noted at the base of two different Beech trees. The most surprising collections were those of Russula parazurea and Russula sylvestris, it isn’t unusual for them to appear at this time of year, it was because of the dryness that I was surprised to see them, so they were most welcome and hopefully a good sign for things to come. 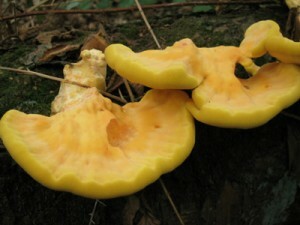 Pleurotus ostreatus, Oyster Mushroom, was recorded from a fallen Beech tree and the first fruitings of Scleroderma citrinum, Common Earthball, were also noted. So all in all, it was a successfull foray, given my initial doubts, though most of the time was spent looking up, rather than the usual looking down. At the end of August I was alerted to the presence of an unusual Bolete fruiting in front of a block of flats in the Epping area, so I went along to investigate. It turned out to be Boletus legaliae, Syn. 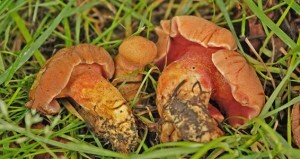 B. satanoides, a rather rare, red pored Bolete, the pale brown cap of which has a pinkish flush during stages of its growth. 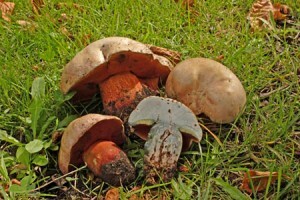 The flesh turns blue upon cutting as with many of these red pored Boletes. The stem has a network pattern (reticulation) and is rooting. More common Look-alikes would be B. luridus and the most common of the three, B. luridiformis (syn. 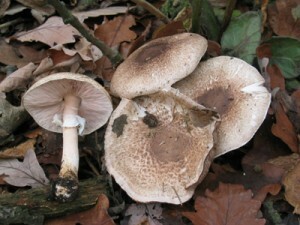 B erythropus), the former with a very pronounced scarlet-red network pattern on the stem and a browner cap, the latter with a red dotted stem amd much darker brown cap, both blue when cut. 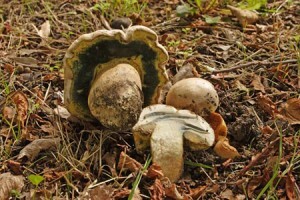 B. legaliae was growing in association with the English Oak (Quercus robur), and was accompanied by another bluing, though yellow pored Bolete with a pale grey/brown cap, Boletus radicans. the stem of which is also rooting, though pale yellow, and often with reddish areas. Another rare Bolete that I happened across was Rubinoboletus rubinus, this time in a local park in North London, in short grass with Lime, its usual host is Oak. This is a much smaller Bolete compared to the other two. August-September can be a good time to see many of the different Boletes. Well, here we are now at the beginning of December with the main mushroom season behind us, fungi are still appearing now, as it is still mild and it is quite wet, though the main flush has well and truly gone. What a brilliant season it turned out to be. With the very hot 2 months of June and July and with the conditions remaining dry for quite some time before and after, I really began to think that we were in for a rough time on the fungi front, especially mushrooms. But you just never can tell, in the end those 2 hot months were the catalyst for a bumper season. When the rain began to arrive during Sept and Oct things really took off. Highlights for me were the numbers of people interested in attending the beginners workshops and the forays, not that it hasn’t been good in the past, it was just that this year, there was a surge in numbers, this could of been a reflection of the good season or a rise in general interest, we shall see when next season comes around. On the fungi front, there were no end of lovely surprises waiting for me out there. not least Gyroporus cyanescens from Puttenham Common, a rare member of the Boletus family, with a more normally Northern distribution. The amount of Death Caps encountered this year was scarily exciting, I recorded it for the first time ever from Hampstead Heath, growing with Hornbeam, apparently an unusual host, but may be not?? It was found at Epping on no less than 4 separate forays, in healthy numbers, so be careful, should next season be anything like this one, which is unlikely. The Panther Cap was also fairly prevalent, as was Amanita gemmata from the Heath ext. The genera Russula, Lactarius, Boletus, Amanita, Cortinarius, Cantharellus, (Chanterelles) Craterellus ( Horn of Plenty), all in fact showed a wide variety of species in good numbers, which is encouraging, as mostly all are mycorrhizal species, which bodes well for our trees. Also for the first time from Hampstead Heath, Calvatia gigantea , The Giant Puffball was recorded, so it is there, albeit very sporadic. The only group that seemed thin on the ground so far this year were the Waxcaps and other grassland fungi, possibly as a result of the very dry period, although I have yet to check my best area for these, I haven’t encountered too many upon my travels. Having now had a very wet autumn, leading into a mild and wet winter, this should bode well for the spring fungi, and a lift on that hose pipe ban. So fingers crossed. A big thankyou for all those who took part in the walks and workshops this year and to those who allowed them to happen. A very big thanks to Carolyne for the wonderful soups and mushroom pate’s on the Hampstead forays, which helped make the forays that more memorable.